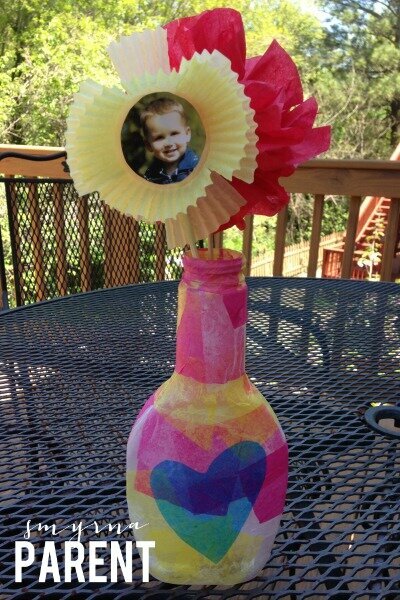 I remember beaming with pride when I made a vase for my mom one year in elementary school. It is very easy to do with things you probably already have around the house! 1. Mix equal parts glue and water in a bowl. You are aiming for a thin, runny glue mixture. Add a little more water if needed. 2. 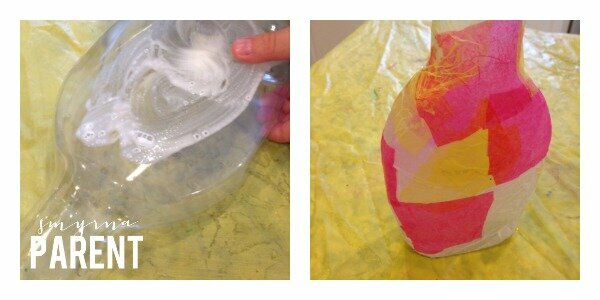 Apply the glue mixture to the outside of the bottle and then cover with tissue paper. (To speed things up, I cut the tissue into large squares ahead of time.) This is where it gets messy, so you may want to protect your tabletop. Keep working your way around the bottle until it is completely covered. Overlapping and wrinkles are good! 3. 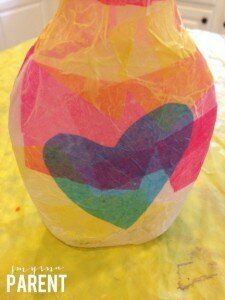 Cut a tissue paper heart and attach it to the front of the bottle. 4. Set your vase aside on a piece of wax paper and let dry for at least an hour. 1. 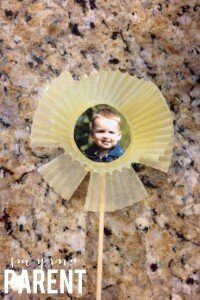 To make the cupcake liner flower, first trace the bottom of the cupcake liner onto your child’s photo. When you cut the photo out, it should fit inside your cupcake liner. Set photo aside for now. 2. 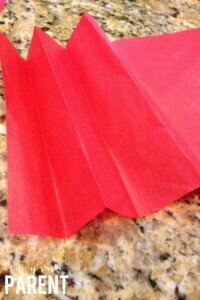 Stick two cupcake liners together by gluing the back of one cupcake liner to the inside of the other. Only apply glue to the flat circular part of the liner. 3. Glue your photo to the inside of the cupcake liner. Use scissors to cut several “petals” in the liners surrounding the photo. 4. 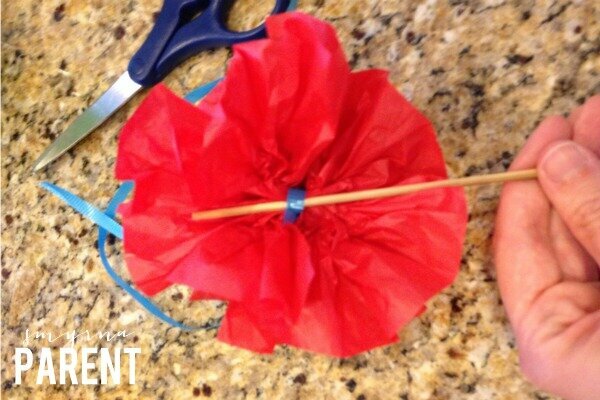 Use tape to attach the flower to a chopstick or skewer. (If you wanted something more permanent, you could sandwich the chopstick or skewer with glue between the flower and a piece of cardstock or felt). 1. 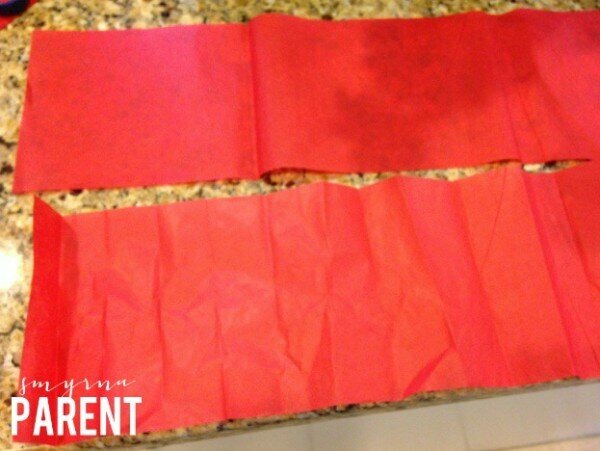 To make the tissue paper flower, cut two pieces of tissue paper measuring roughly 4″x 20″ (essentially the entire width of the sheet you are using). 2. 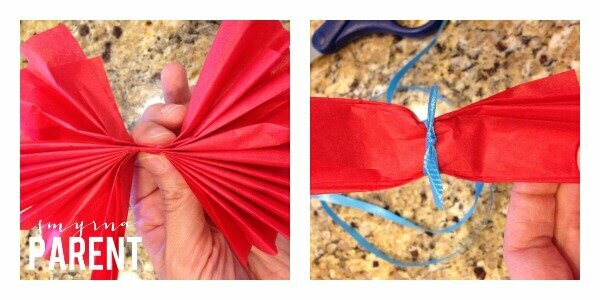 Place the two strips of tissue paper on top of one another and accordion fold them from one end to the other. 3. 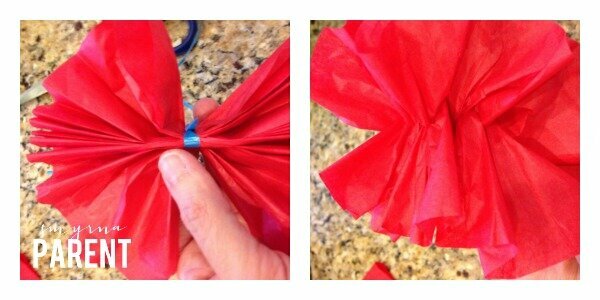 Use a twist tie or small piece of string and tightly tie a knot in the center of the folded paper. 4. Begin separating the two pieces of tissue from one another, working your way around the whole “flower.” Twist and turn it in places where you’d like it more full. It won’t be perfect but therein lies the charm! 5. Slip a chopstick or skewer into the center knot. It should stay in place fairly easily if the knot is tight. If not, use tape or glue to secure it to the chopstick or skewer. There you have it! Happy Mother’s Day!